Welcome to the first instalment of an exciting new story series in which we’re on the hunt for mighty people from around the UK and beyond. We’ll be chatting to some truly inspirational people from all walks of life and getting inspired about the things our marvellous species can achieve after a hearty (oaty) breakfast. 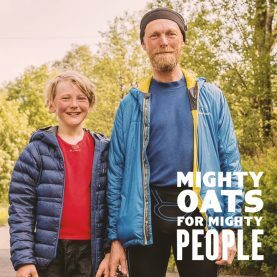 This is Mighty Oats for Mighty People. To kick things off, we caught up with the lovely Ross Spalding to talk all things adventure (and oats of course). Fell-runner, rock climber and an all-round adventurer, Ross is always on the hunt for a challenge that whisks him away to the rolling hills of the Scottish countryside. His original inspiration for taking up fell-running and adventure-running was a newfound love of climbing. “I’d begun hiking more and looking for crags and scrambles and felt I was able to hike faster each time” he said. Running the Ochils near his home in Falkirk helped him improve his fitness day by day, sparking his desire to get outdoors. But with every extreme sport comes an extreme challenge. Ross faced his biggest one yet when he ran the Glencoe Skyline, a true test of his physical endurance due to its breathtakingly steep ascent and the sheer amount of time he spent in the mountains. Ross told us he’s trying to become a morning person again, and it certainly sounds like it: a typical morning for him involves running, cycling, or climbing, so a hearty breakfast goes a long way. From Bircher-style overnight oats to a warming bowl of porridge, oats are a kitchen cupboard staple that provide heaps of energy and keep him fuller for longer, especially when it comes to that all-important race day. “A race-day breakfast for me is normally kept simple. Porridge is my go-to with whatever fruit I have. 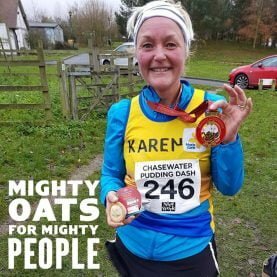 Especially when camping and waking up to a cold morning, it’s nice to have something hot and it makes good fuel for racing.” Simple, delicious and full of goodness, our oats are the perfect way to start the day. Nothing beats stepping out in the fresh, crisp countryside air and snapping all the beauty that the great outdoors has to offer. “I’ve recently not been taking photographs as much which is also something I’m really keen to get back to doing.” Capturing his awe-inspiring adventures makes us want to get our gear on and get back to nature!